A 29-year-old woman was assessed at a Primary Health Center with symptoms of nausea, vomiting, and diarrhea. The patient had been in her usual state of good health until the day before the presentation, when nausea, vomiting, diarrhea, fever, muscle aches, and a mild nonproductive cough developed suddenly. She had no sinus congestion, sore throat, shortness of breath, or abdominal pain. Over the telephone on the morning before the presentation, she reported that her symptoms were severe and had prevented her from attending work. However, when she was evaluated later in the day by a provider at her primary care clinic, she reported that she had had spontaneous improvement in the morning and felt well on arrival at the clinic. The patient had a history of exercise-induced asthma, gastroesophageal reflux disease, vitiligo, and genital warts. Two years back, she had had negative screening tests for hepatitis C virus and human immunodeficiency virus. Fifteen months before presentation, she had received a diagnosis of influenza. During the months that followed, she had reported persistent bouts of fatigue and excessive sleepiness that had resulted in two motor vehicle accidents. During the first event, which had occurred 13 months before presentation, the patient fell asleep while driving and her car crossed into the other lane, over the curb, and into an open space beside the road. She did not collide with any other vehicles or structures and had no trauma. During the second event, which had occurred seven months before presentation, the patient collided with a turning vehicle. She did not lose consciousness, and the airbags did not deploy. After the crash, she had intermittent painful episodes of muscle spasms in her neck and low back that limited her range of motion. She was too fatigued to seek medical attention until the day after the collision. The patient subsequently underwent an evaluation at her primary care clinic. Her score on the Epworth Sleepiness Scale was 20, with scores ranging from 0 (low-normal daytime sleepiness) to 24 (excessive daytime sleepiness). She was referred for a formal sleep study. Also, she received prescriptions for naproxen and cyclobenzaprine and completed outpatient physical therapy, and her muscle spasms diminished. The patient had not undergone any surgical procedures. Medications included omeprazole, varenicline, naproxen, and cyclobenzaprine. Hydrocodone-acetaminophen had caused nausea. The patient was adopted, and her family history was unknown. She lived in an urban neighborhood in New England with her daughter, brother, and sister. She worked two full-time jobs, as a school counselor and a bartender. She smoked one pack of cigarettes weekly and had done so for 17 years, and she reportedly drank two to three alcoholic beverages weekly. On physical examination, the temperature was 36.8°C, the pulse 106 beats per minute, and the blood pressure 117/91 mm Hg. The weight was 63.5 kg, the height 170 cm, and the body-mass index (the weight in kilograms divided by the square of the height in meters) The patient appeared to be well. She had no diaphoresis or rashes, needle marks, or scars. The pupils were equal and reactive, the mucous membranes were moist, and the abdomen was soft, with no tenderness on palpation. Results of liver function tests were normal, and testing for urinary human chorionic gonadotropin was negative. Just before the conclusion of the office visit, the patient reported a history of use of nonprescribed oxycodone–acetaminophen tablets and requested initiation of therapy with injectable intramuscular naltrexone. Urine toxicology screening was ordered, and oral naltrexone was prescribed. A follow-up visit was planned for 6 days later, but the patient did not complete the urine toxicology screening or return to the clinic for her scheduled follow-up. However, two months later, she requested a referral for psychotherapy because of increased symptoms of stress. Four months after she requested the referral and six months after presentation, the patient was seen in the outpatient psychology clinic of this hospital, where additional history was obtained. She reported poor sleep, low energy, loss of interest in enjoyable activities, feelings of guilt, increased appetite, and a sensation that her legs were heavy and difficult to move. She also reported intermittent episodes of heightened energy, pressured speech, racing thoughts, and excessive spending. She had no history of hallucinations or thoughts of harming herself or others. At the psychology clinic, the patient reported that she had begun to use illicit drugs — including marijuana, oral opioids, cocaine, and methylenedioxymethamphetamine — when she was in middle school. She had continued to use multiple substances for five years but had abruptly discontinued when she became pregnant, at 19 years of age. She did not use illicit drugs for eight years after the birth of her daughter but then resumed regular use of oral opioids three years before presentation, when she began to work at a bar where drugs were frequently available. Since then, she had used escalating amounts of oral oxycodone to satisfy increased cravings and prevent withdrawal symptoms. The patient reported that she used 120 mg of oxycodone per day and spent approximately $3000 per month on oxycodone. She had missed work because of withdrawal symptoms, and she worried that she would lose custody of her daughter because of her drug use. She had never been hospitalized for opioid use or had an overdose. On several occasions, she had used nonprescribed buprenorphine, which had alleviated her withdrawal symptoms and cravings, but she had never tried buprenorphine treatment that had been prescribed by a health care provider. Besides, on several occasions, she had tried to initiate treatment with injectable intramuscular naltrexone but had been unable to abstain from opioid use long enough to receive the treatment. A plan was made for the patient to continue with outpatient cognitive behavioral therapy and mindfulness exercises, and a follow-up visit with her primary care physician was scheduled. One month later, the patient was seen by her primary care physician. Oral-fluid toxicology screening was positive for oxycodone, buprenorphine, benzoylecgonine, and cocaine; testing of the saliva was negative for fentanyl. Diagnosis and management decisions were made. This 29-year-old woman presented to her primary care clinic after she had symptoms consistent with opioid withdrawal syndrome, which had spontaneously resolved in less than one day. At the end of the visit, she requested injectable intramuscular naltrexone, and she later described a history that fulfilled criteria for severe opioid use disorder. The patient reportedly used approximately $100 worth of nonprescribed oxycodone per day, and this was at high risk for the use of heroin and illicitly manufactured fentanyl, which is more potent, widely accessible, and less expensive. However, according to the history and results of urine toxicology screening, her opioid use disorder was limited to use of illicit oxycodone. Although the patient requested naltrexone treatment, she did not complete the urine toxicology screening or return to the clinic for six months. I suspect that the patient had some ambivalence about treatment, which is common among patients with substance use disorder. Despite any ambivalence, the high mortality associated with opioid use disorder makes it imperative to find an effective treatment for this patient. First-line treatment for this patient would be one of the three medications approved by the Food and Drug Administration (FDA) for the treatment of opioid use disorder: naltrexone, methadone, or buprenorphine. These medications lead to longer retention in treatment and decreased opioid use and opioid cravings. In a meta-analysis, methadone and buprenorphine were strongly associated with decreased rates of overdose and death from any cause.2 In choosing the best medication for this patient; it would be necessary to have an understanding of not only the treatment-program requirements for each medication but also the patient’s preferences and previous experience with these medications. This patient indicated a preference for naltrexone (an opioid antagonist). Oral naltrexone is available in generic form and is administered once daily as a tablet. However, meta-analyses have shown that oral naltrexone is no more effective than placebo in lowering the rate of opioid use or increasing the rate of retention in treatment.3 Injectable intramuscular naltrexone is administered every 28 days by a health care provider and is effective in reducing opioid cravings and illicit opioid use. Prescribing naltrexone does not require specialized training or licensing, although prescribing injectable intramuscular naltrexone often requires prior authorization from an insurance company or collaboration with a specialty pharmacy. The initiation of either injectable or oral naltrexone treatment precipitates withdrawal symptoms if the patient has not abstained from opioid use for several days before initiation. Of course, abstinence also causes withdrawal symptoms, which are a potent driver of continued substance use. Achieving the abstinence that is necessary to initiate naltrexone therapy is a significant challenge; this explains the patient’s unsuccessful attempts at treatment with naltrexone. If she again attempts to undergo treatment with naltrexone, how can she and her provider work together to increase the likelihood that she will continue to take the medication? Before the initiation of naltrexone treatment, the patient’s withdrawal symptoms should be treated either in an inpatient detoxification unit or at home on an outpatient basis, with comfort medications, social support, and close follow-up. In contrast with naltrexone, methadone (a full opioid agonist) is not associated with a risk of precipitated withdrawal, so abstinence before the initiation of methadone treatment is not necessary. However, because methadone has a relatively long and unpredictable half-life, the treatment must be initiated carefully. An initial low dose and slow approach help to ensure that the patient is not oversedated during the first several weeks. As a treatment for pain, methadone can be prescribed and dispensed like any other opioid pain medication, but as a treatment for opioid use disorder, methadone can be administered to patients outside the hospital only through an opioid treatment program that is licensed and regulated at the federal and state levels. If this patient were hospitalized for a reason other than addiction, she could be treated with methadone for opioid withdrawal, and if on discharge from the hospital she were linked to an opioid treatment program, she could be treated with methadone for opioid use disorder.4 Regulations for opioid treatment programs require patients to receive methadone daily at the clinic and to undergo weekly counseling, random toxicology testing, and medical and psychiatric assessment. Patients may earn “take home” doses after 60 days of documented abstinence and with perfect attendance of dosing and counseling appointments. Methadone treatment through an opioid treatment program is one potential option for this patient to consider. Buprenorphine (a partial opioid agonist) can precipitate withdrawal if the patient has not abstained from opioid use for several hours before the first dose and has not begun to have withdrawal symptoms. Like naltrexone, buprenorphine can be prescribed in any clinical setting, although to prescribe buprenorphine in an outpatient setting, a waiver must be obtained from the Drug Enforcement Agency after completion of additional training (8 hours for physicians and 24 hours for nurse practitioners and physician assistants). Buprenorphine is typically combined with naloxone in a sublingual or buccal formulation to reduce the potential for injection or diversion. The FDA approved a long-acting injectable buprenorphine formulation in 2018. This patient had some experience with the use of buprenorphine that had been obtained by illicit means. I would ask the patient whether she had any withdrawal symptoms, sedation, or dysphoria when she took buprenorphine; whether it helped reduce her oxycodone use; and how well she functioned while she took it. If buprenorphine had worked well for her, then I would ask why she requested naltrexone rather than buprenorphine during her primary care visit. As agonist treatments, buprenorphine and methadone are often stigmatized as “trading one drug for another.” This stigma undermines the clear evidence from multiple clinical trials that buprenorphine and methadone therapies can break the addiction cycle of compulsive use. Adherence to treatment is a significant challenge for patients who receive any of these three medications. It is worth noting that patients who take methadone may have longer retention in treatment than those who take buprenorphine, and patients who take buprenorphine have longer retention than those who take naltrexone. In the first four weeks after discontinuation of these medications, there is a surge in overdose mortality, two which is driven by the high likelihood of relapse coupled with reduced tolerance. Before the initiation of naltrexone, methadone, or buprenorphine treatment in this patient, it would be crucial to explaining to her that she is at very high risk for relapse and overdose if she discontinues the medication. Regardless of the treatment that is chosen, this patient will need a strategy to reduce the risk of overdose in the event of relapse. Critical elements of an overdose risk-reduction plan include the use of opioids in the presence of others who are equipped with naloxone and can respond if overdose occurs; avoidance of additional sedative substances, such as benzodiazepines and alcohol; and administration of the opioid at the lowest possible dose and slowly to test its potency. Following guidance from the Department of Health and Human Services, a naloxone rescue kit should be prescribed to this patient so that she can be prepared to respond to an overdose that she witnesses and can ensure that naloxone is available to anyone who is with her if she relapses. 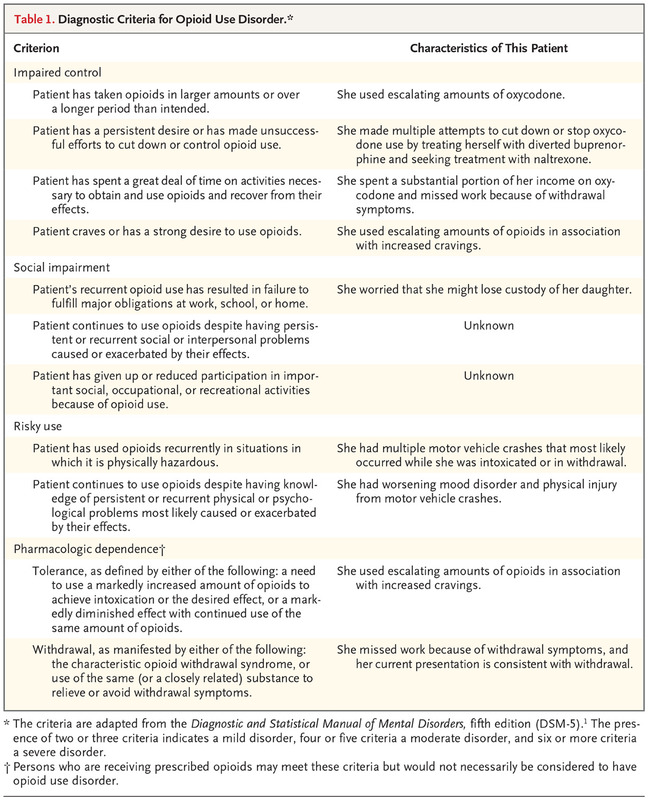 This case shows several ways in which the care of patients with opioid use disorder can be improved. During the patient’s previous encounters with the health care system, there were missed opportunities to discuss and diagnose her opioid use disorder. Although the U.S. Preventive Services Task Force has found insufficient evidence to support universal screening for substance use disorder, screening was warranted in this patient on the basis of her history, which included multiple risk factors for substance use disorder, such as tobacco use disorder, underlying mood disorder, fatigue and daytime drowsiness, and motor vehicle accidents. Although overdose has replaced motor vehicle crashes as the leading cause of injury-related death in the United States, this case reminds us that a substantial proportion of motor vehicle crashes involve the use of substances — most commonly alcohol but increasingly other substances, such as marijuana and opioids. Effective screening can be accomplished with one question: “How many times in the past year have you used an illegal drug or used a prescription medication for nonmedical reasons?” In this patient, the answer to this question, followed by further exploration of the frequency of her substance use and the quantity that she used each time as well as an exploration of the consequences of her use, could have allowed her providers to address her substance use disorder at an earlier stage. When the patient requested medication for opioid use disorder, she most likely had already met the criteria for this diagnosis. However, it is useful to review the diagnostic criteria with the patient to confirm the diagnosis and its severity (Table 1). The criteria will continue to be useful for monitoring this patient. As her condition improves, the number of criteria she meets will decrease, indicating reduced severity. This patient has at least two promising prognostic characteristics. First, she is seeking treatment and has sought treatment in the past. It is normal for patients with substance use disorder to have multiple episodes of attempted treatment and relapse, but over time, the relapse periods should shorten and the remission periods should lengthen. Second, she abstained from drug use for years after the birth of her daughter, which is a sign that she may be able to abstain in the future. The patient is receiving care from primary care and mental health care providers. Who would best treat her opioid use disorder? Does she need specialty treatment? If she and her providers decide that methadone is the best option, then she will need to enroll in an opioid treatment program, which is typically separate from primary care and mental health care. If they choose naltrexone or buprenorphine, either treatment can be delivered effectively in the primary care or community mental health care setting. The patient should receive care in the setting in which she is least likely to discontinue treatment, thus minimizing her risk of relapse and overdose.